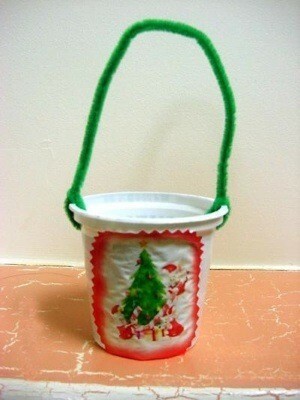 A quick and super cute decoration for your Christmas Tree. Especially great for any home with young children. I spray painted the yogurt cup and then glued on small designs cut from Christmas wrapping paper. 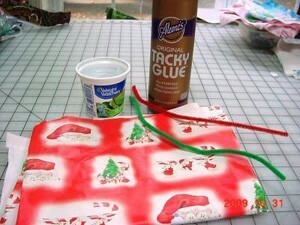 The containers/cups could also be covered in glue and then sprinkled with glitter. The cups could also be covered with paper or fabric. Use your imagination to decorate. Punch a small hole on two sides of the cup and insert a chenille stem handle for hanging. Yarn, ribbon or heavy thread can also be used for a handle. Add a bit of tissue paper to the inside of the cup and fill with a tiny treat for the kids, tiny toys, a piece of candy/gum, stickers or anything small that is appropriate for your age children. A number could be placed on the outside of enough cups and then used as an Advent calendar. The children will get involved and will anticipate the coming of Christmas as the days pass!